United Way of Martin County's White Doves Holiday Project/Toys for Tots has completed toy distribution for 2018. THANK YOU for your support! 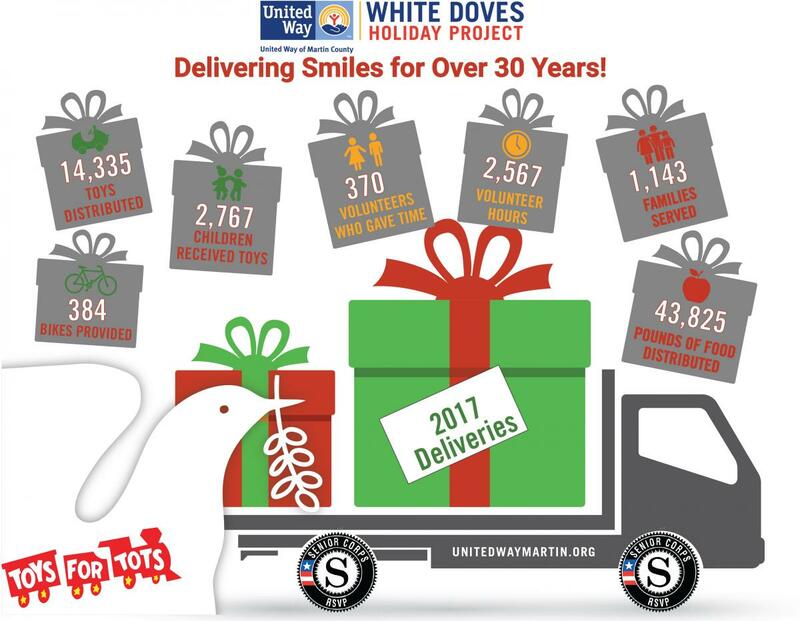 United Way's White Doves Holiday project responds to a huge community need and pools the resources of hundreds of volunteers, community groups, agencies, families, businesses and faith-based and civic organizations. The White Doves Holiday Project serves as a central clearinghouse for donated food and toys at holiday time. United Way is the official local coordinating organization for the Marine Corps Toys for Tots drive, helping our struggling families during the holidays by providing toys for their children. Families are referred to White Doves by social service agencies, schools and faith-based groups – organizations who know the families intimately and understand their needs. The names of the families are then matched with other holiday providers to avoid the duplication of services. Clients range from parents with children to homebound senior citizens. One of the things that make White Doves special is that it offers clients the chance to go shopping -- for free. The parents are invited to make selections for their children from tables filled with toys sorted into age and gender and appropriately displayed. After selecting gifts for the children and possibly winning a bike for one of their children, they also receive a bag of groceries – the staples for a holiday meal. For more information, call 220-4472 or send us an email.